As if Super Mario coming to iOS isn't enough, Apple just announced that Pokemon Go is heading to the Apple Watch. 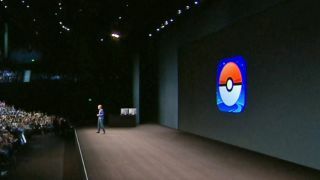 Developer Niantic came on stage to discuss the integration, highlighting that the game, which *forces* you get up and move in order to catch Pokemon, is the perfect fit for the Apple Watch's health tracking features. As you play, you'll be able to track calories burned and distance traveled. You can see what Pokemon are nearby at a glance, and a quick tap will pull up a Pokestop. Pokestops will be noteworthy locations, such as public artworks or historical landmarks.